Ashley Coston Taylor has been a teacher for 18 years, and every morning she makes her "littles" start their day the same way: with a handshake and a smile. 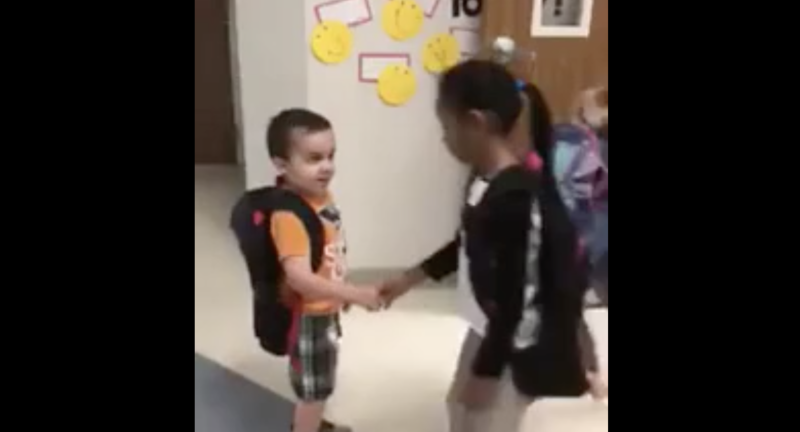 A video that Taylor posted on Facebook last week shows her kindergarteners at Keene Elementary School in North Texas lining up to give a big handshake to a classmate. She says this is a daily practice. Every day, one student acts a "greeter" and stands at the classroom door. All the other kids line up to give the greeter a handshake and say good morning before walking into the classroom to take their seats. Taylor hopes this simple practice makes a powerful difference in her students' development. In the video, which has since gone viral, Asher Bales is the greeter, and his fellow classmates greet him with a handshake and a smile. Some of the kids hug Asher, too. In fact, once one student in line gives him a hug, almost every other child follows suit. The last student gives Asher a handshake and a hug, and then Taylor gives him a handshake herself. The kind greeting touched the hearts of thousands. "When I see the direction the world is heading, it reminds me what I am doing WILL make a difference!" Taylor wrote in a caption when she posted the video on Facebook. Taylor says the morning handshake teaches the greeter and the rest of the class good manners and that "someone is on their side," the Forth Worth Star-Telegram reports. "The school shootings have been a real eye opener," Taylor told McClatchy Newspapers. "Maybe if some of those kids had felt like someone was on their side, things would have happened differently. I understand there are lots of factors that play into those situations. But what if, you know?" Taylor believes each of her "littles" deserves a classroom where they know they are accepted and have friends, and this positive interaction at the start of their day can help them learn that.